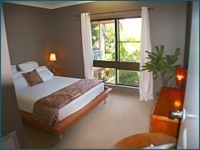 If you feel priced out OR crowded out of Port Stephens, why not stay at beautiful Mission Beach opposite Dunk Island in North Queensland - very nice 2 bedroom Rainforest Apartment at discounted tariff of $525per week/5 persons - http://www.rainforestapartments.com Go on ... have a look!!! 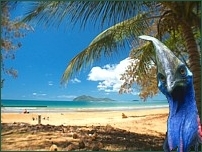 Do something different this year - you just might fall in love with the tropics and never want to leave! It is probably the ultimate wildlife experience to witness the 15m and 48 tonne bulk of the Humpback whale as it propels itself skyward with powerful thrusts of it's tail and crashes back into the ocean. Approximately 3,500 humpback whales migrate north to the tropics from late May to July and return to the Antarctic in September to November. 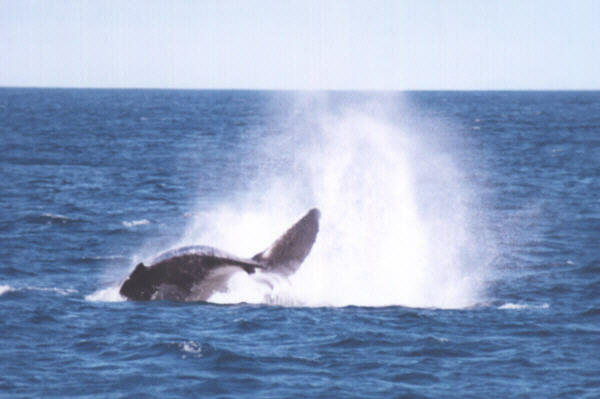 The whales are easily sighted by their tell tale plume of water spray and usually are quite close in to the shoreline - pods of whales can be quite playful, slapping the water with their tails and at times leaping almost right out of the water. 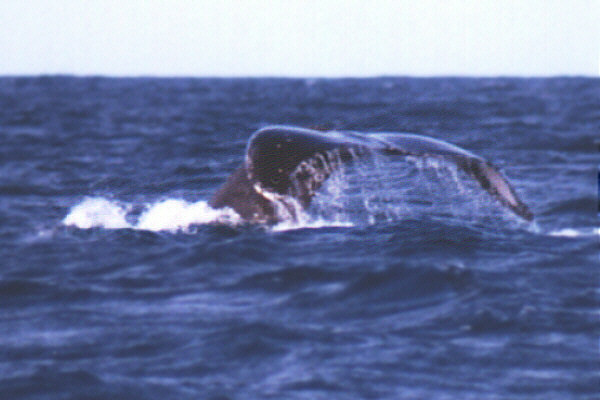 Because the islands and headlands off Port Stephens extend so far east, the whales come in very close to the mainland on this 5,000km migration. Brydes whales, Minke and Killer whales are also seen regularly. 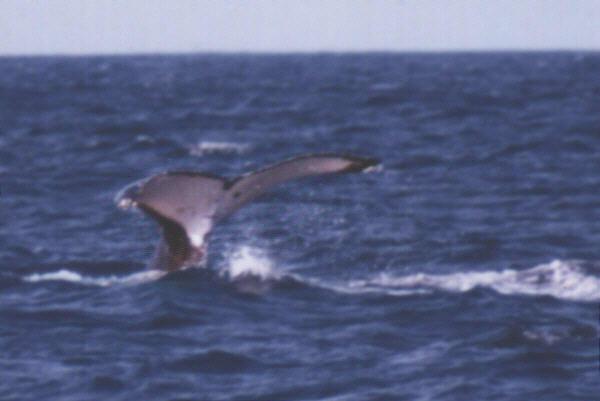 The best way to see the whales is on a cruise but they can also be seen close to the shore from Fingal to Anna Bay - look for the whale blow as it comes up to breathe. 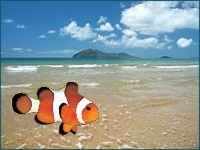 On a good day, it can be seen as far away as 2km, surfacing for four or five breaths every 4 to 8 minutes. Photographic Equipment: Entry level 35mm Minolta 500Si camera with a budget 300mm zoom lens. Film used is Agfa 100ASA purchased from BiLo supermarket in Nelson Bay ( $10 for 3 rolls ). First 4 pics and the animation sequence on the Dunesnet.com front page taken with a Canon AZ5 Zoom digital camera. What a great day! Moonshadow have a 3 hour afternoon Whale Watch cruise and nearly always spot whales this time of year. This was the first boat based whale spotting we've done since moving here, although many times we've sat on the rocks at Birubi Point and watched the whales resting just off the shore. 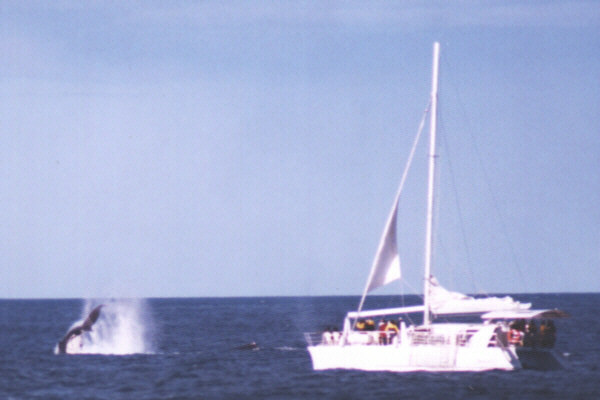 Barely 20 minutes after leaving the Nelson Bay Marina, the "Imagine" and "Moonshadow" were both just through Tomaree Heads when the first whales were spotted. 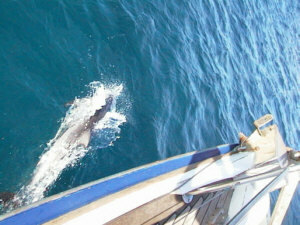 What followed was an at times rather exciting spectacle put on by the whales. After following a group of 5 whales for a while, we motored towards Broughton Island and more whales before turning back. On the way back to the Nelson Bay marina, spotted a few dolphins frolicking outside Shoal Bay and then picked up a large pod of perhaps 20 or so dolphins in the middle of the bay before heading home as the sun was setting. Played 'tag' with the "Imagine" for the whole afternoon and managed to pick up a few good pics of her ( one rather spectacular pic of a huge whale crashing into the water just in front "Imagine" ) and the whales and dolphins. 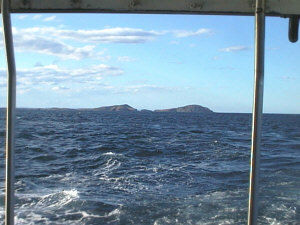 Bow of the "Moonshadow" about to go past Tomaree Head. 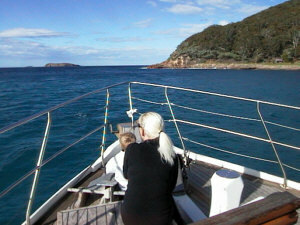 As we were going past Tomaree Head, a solitary dolphin picked up the bow wave of the boat. 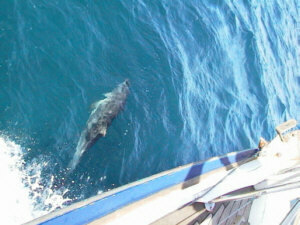 To the delight of the passengers, the dolphin stayed with the boat for about 5 minutes. 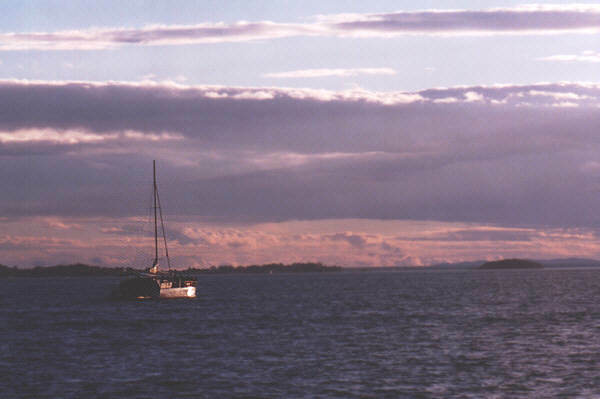 From the stern of the "Moonshadow" looking back to Broughton Island. 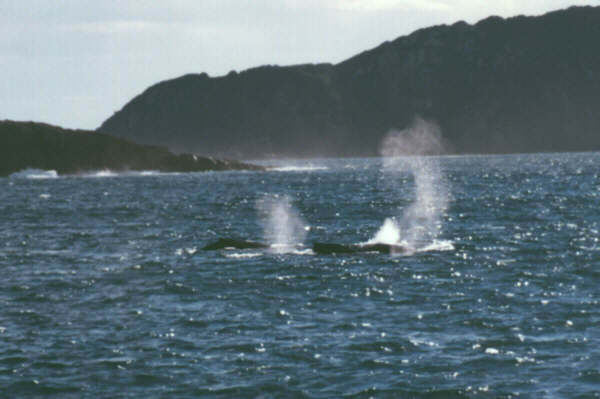 Just outside the heads, the first whale plumes were spotted. 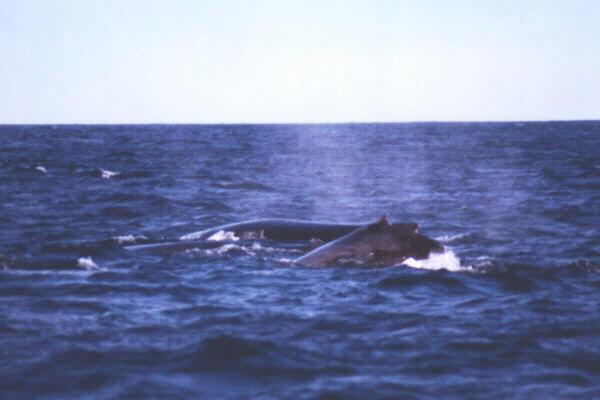 The first group of whales were with the boat for almost an hour. ... right in front of the "Imagine". Heard later a few passengers needed a towel! Amazing what photo results budget film can produce! You need to be close to get a feel of the sheer size. 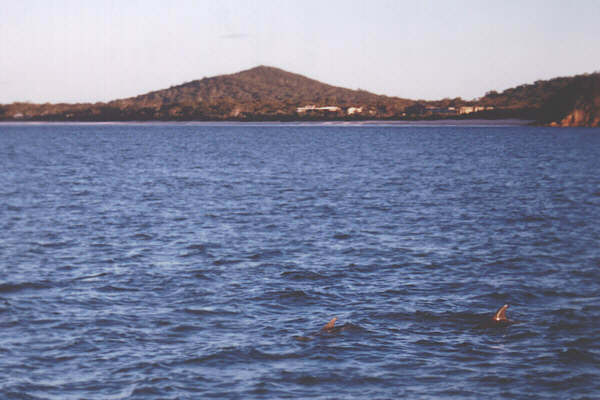 On return trip, dolphins with Shoal Bay in background. 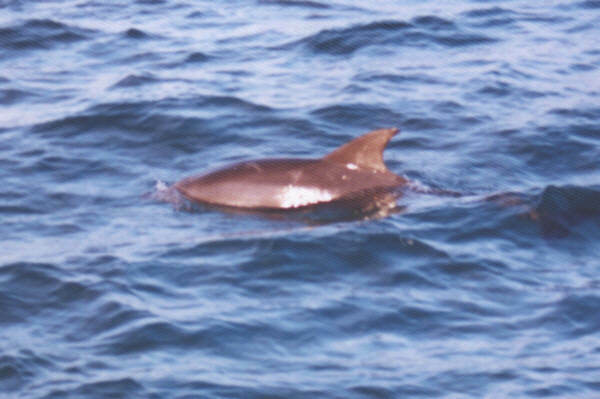 Closeup of one of the Shoal Bay dolphins. 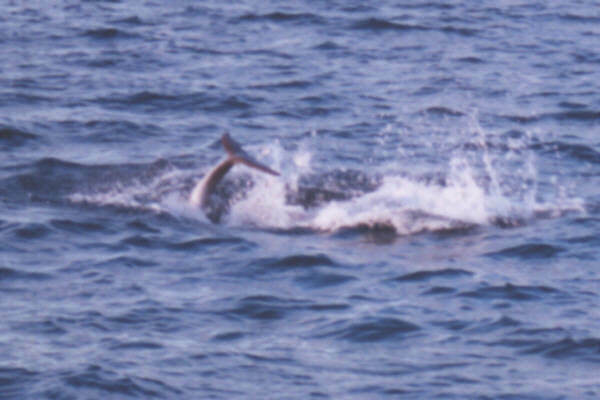 Dolphins playing in the middle of the Bay. 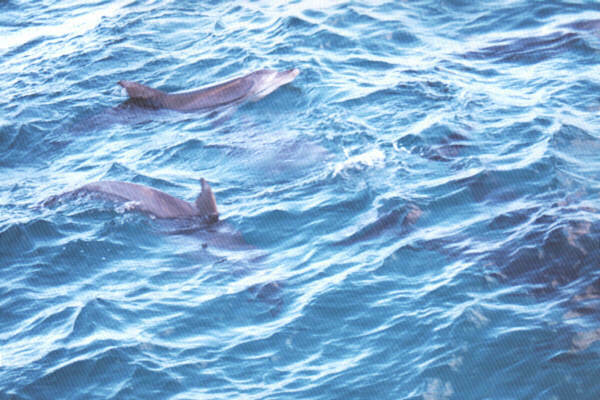 Part of the pod of 20 dolphins spotted on the return trip. "Imagine" heading home after 4 hour whale watch cruise. 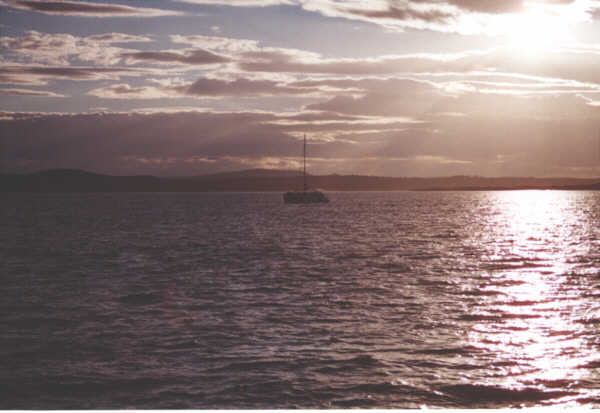 "Imagine" at sunset with Soldiers Point in the background. Website information please phone Paul on 0249 821633.